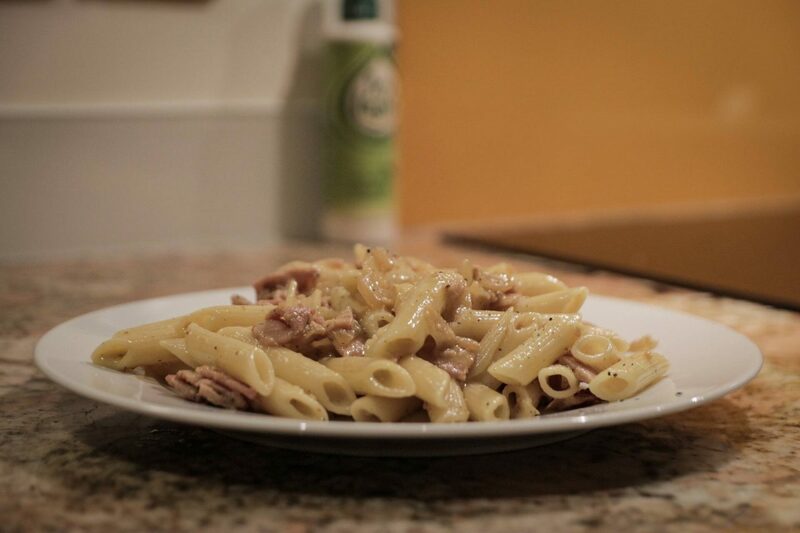 The Best Syn Free Slimming World Carbonara Recipe! Over the next week, I’m going to be trying a handful of new Slimming World friendly recipes so I thought it’d be nice to share some of them here with you if they went really well. I’m not one for sticking to recipes exactly so these will all have my own twists on them. The original recipe for this comes from Slimming Eats but we changed a few bits as we went along as the portion size wasn’t big enough and we dislike herbs when cooking. As you all know, I’ve promised to reduce my meat intake this year so next time I cook this I will be trying out the Quorn bacon alternative to keep on track with that. I wasn’t able to get any for this recipe as I’m not currently cooking from home kitchen. While you are chopping up your bacon and onions, cook your pasta according to the packet instructions. When it’s ready, drain it, put the pasta to one side but remember to save 80ml of the pasta water. In a small bowl whisk together 30g of your parmesan, the complete egg, the egg yolk with a little salt and pepper for seasoning. As you’re whisking gradually add in the water you saved from your pasta to ensure the egg doesn’t scramble when you pop it in with your pasta. Next up, use some Frylight to coat a frying pan and get your bacon on the go. I got mine to a nice crispy texture, but fry yours to how you like it. Once you’re happy, set the bacon aside and add the onion and garlic to the pan, and sauté away. 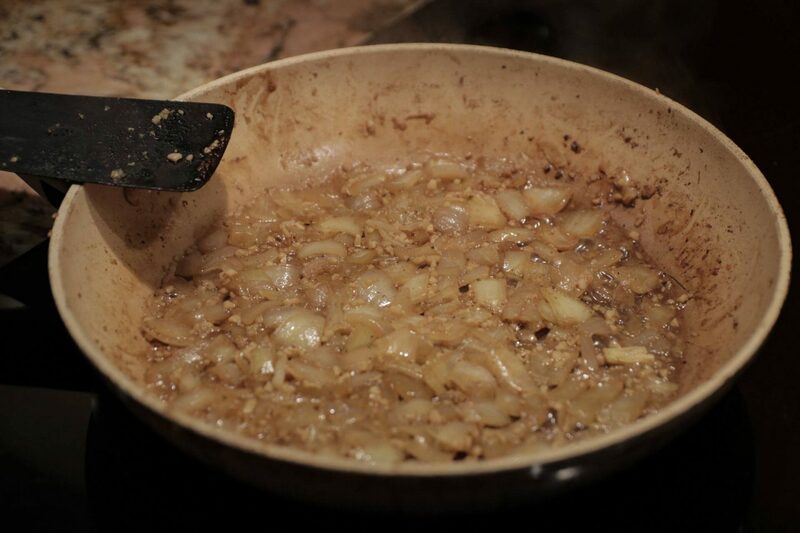 If the garlic and onions start to stick, as mine did, keep adding small amounts of the vegetable stock. Each time the stock disappears, just add a little more until you’ve used all of it. 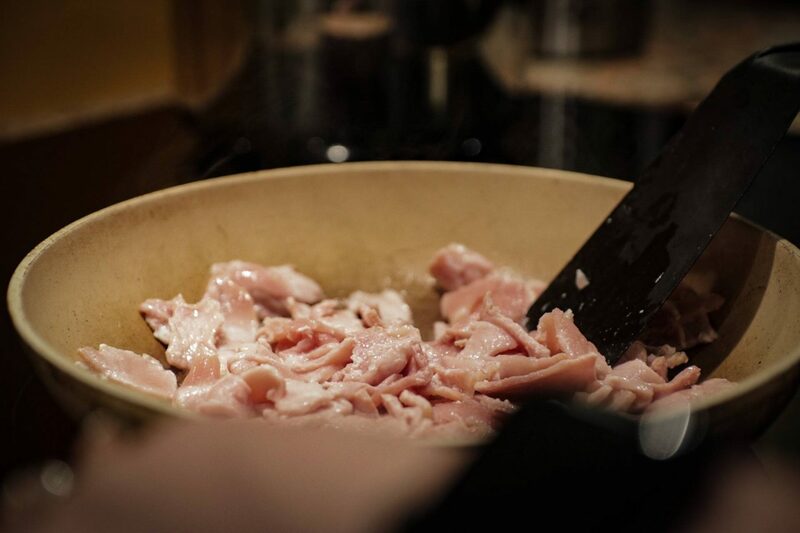 Reduce the heat of your hob and stir in the bacon. Once that’s hot again, add in the pasta and keep stirring until that’s a good enough temperature to eat. Take the pan off the heat and stir in the parmesan and mixture. Make sure all the pasta is coated and the bacon is evenly distributed throughout the pasta. 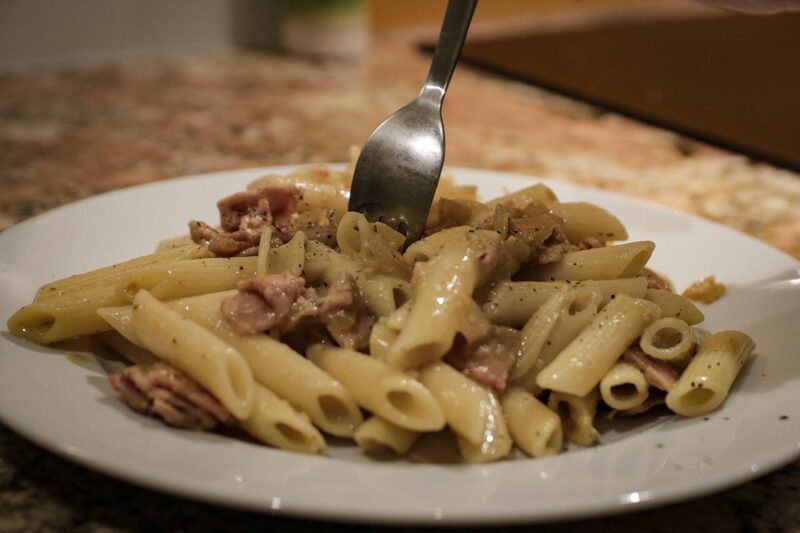 Grab two plates and share the wonderful carbonara you’ve just created between them. As we like things a little spicy we added a shake of chilli flakes to go with the additional parmesan and black pepper. I was a little worried this wouldn’t taste like legit carbonara without having cream in, but it was so good! I’m thinking this could become a weekly meal as it’s so easy to make as long as I can get it to work with a meat-free alternative! Turtle Bay comes to Essex!